When media attention dwindles, we are left to merely imagine the after-effects of a natural disaster. How does a community recover from such a large-scale event? How do people unite to rebuild lives and towns when, in fact, so many are mourning their loved ones? This novel, set in Japan, is the first in a promising new spin-off set of ‘Through My Eyes’ books (created by Lyn White) focusing specifically on natural disaster zones. 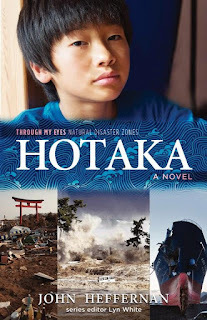 The story is told from the perspective of a boy named Hotaka, and begins on March 11, 2011 – the day the northern coastline of Japan was struck by a tsunami that killed around 16,000 people. John Heffernan, who spent a month in the damaged Tōhoku region of Japan to research the novel, vividly describes the residents’ chaos and fear in a gripping, nail-biting introduction. Sakura, whose own tragic past is eventually revealed, starts a major community revolt against the wall, against the government and against the construction company. Together with Hotaka, Osamu, and the power of social media, their campaign reaches far and wide … but it seems the corrupt mayor will stop at nothing to silence them.